I must have the cardiovascular endurance of an 80 year old with a heart condition, because I can count on one hand the number of times I’ve gone for a run or jog in the past two years (thumb not included). I created in my mind a sort of “pact” not to do anything that I don’t want to do, or will make me suffer. Running = suffering, if you never do it. I also felt that running was uncharacteristic of Nikki. Even my friends know that I don’t even like to walk fast. 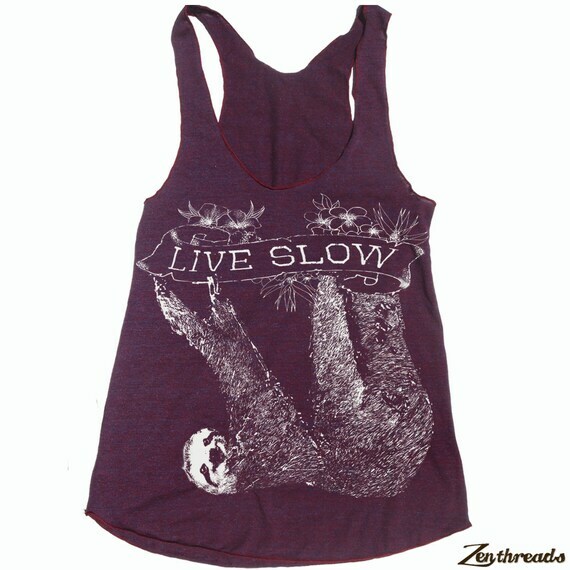 Isn’t life better when it’s slower? Yesterday though, the race-bug bit me and I surfed through the seemingly endless number of “fun runs” happening in Boston within the next few months. By now, you’ve probably been bombarded with ads (or maybe they’re just directed at students?) about glow runs, or color runs, which often involve being blasted with a colorful powder (holi) every few meters into the reasonably distanced race. I hate being left out of anything because of the lack of an ability I can easily gain – so I have this bright idea to enter the Blacklight Run, which takes place at the end of October and doesn’t start until 7pm. That’s almost two months, I told myself, to figure out how to run. It is a 5k “race,” un-timed, and you end up a colorful, glowing mess. This sounded like the kind of social event I needed to partake in, and so I paid my early-bird fee and begged my friends to join me. Step one, complete. Step two: run. I knew I would never go for a run unless I had a really good reason to, and spending any amount of money entering a race is more than enough incentive for me! After I got home from work yesterday, I mapped out the route I would need to take in order to run exactly one mile (baby steps, folks). I put on my running gear, which happens to also be my yoga gear, since oh right, I don’t run. I would have stretched, had I known how to stretch for running. I almost Googled it, but I knew that was just another way to procrastinate. I took off with Pitbull and Ke$ha blasting in my ears. Someone failed to tell me about the giant hill that was included on my trail. I practically crawled up the hill, and on my return essentially fell back down. When I got home, I was surprised that I wasn’t collapsing on the pavement, gasping for air. I did a dance inside my head to celebrate (would’ve been Azonto if I knew how to do it). I insisted that it wasn’t a full mile to my grandpa though, who noted “that was fast.” Mile or not, it was the first step to me running this 5k. I can’t say I felt “good” after the run, but I didn’t feel bad, which is a significant improvement since the last time I ran anywhere. I think this will get easier as I drop the notion that “I’m not a runner,” and just start moving. Ahimsa, people. This yama of yoga means non-harming, but it doesn’t just apply to others. Don’t be the person who brings him/herself down! My grandma always says that the surest way to get her to do something is to suggest that she can’t do it – I’m not quite as competitive (or at all competitive…) but like I said before, I don’t want to limit myself. If I choose to do a 5k, I want nothing to stand in my way of doing it, sore legs or aching chest included! YOU CAN’T TELL ME NO! Alas, prepare for more insightful running experiences, as I’m not going to “just do it,” I’m just doing it. P.S. – The link to the Blacklight Race is here if you’re interested!